We tested AVG AntiVirus FREE to find out if it's the right antivirus software to make your digital life more secure. AVG AntiVirus software uses artificial intelligence (AI) technology to recognize the operating patterns and warning signs of malware on your computer and online. It detects and blocks viruses, spyware, ransomware, adware, and other damaging programs that can infect your hard drive and leave you open to identity theft. Online, it can warn you of potentially harmful links and scan websites for malware. AVG works in the background anytime your computer is turned on, and when the program discovers a threat, it alerts you and places the infected files into quarantine so you can’t accidentally access them. You can then remove the files with just a few clicks. AVG works with Mac, PC, and Android devices. AVG AntiVirus FREE is the company’s basic plan. AVG Internet Security is the next step up, with additional features and an annual cost. 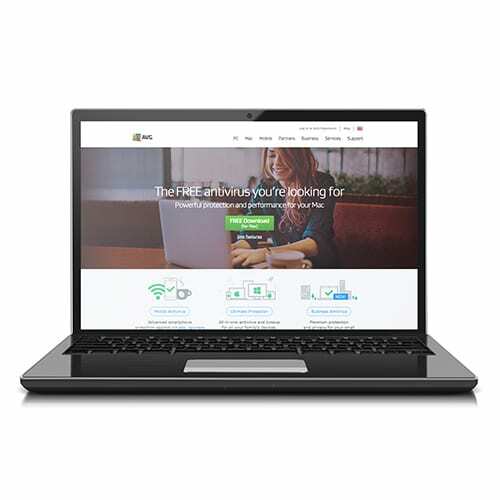 AVG offers a free one-month trial of AVG Internet Security with no credit card required. After the month is up, if you choose not to continue with the upgraded package, you’ll automatically revert back to the free version. While AVG does offer antivirus protection for Android products, there are still no antivirus products to protect iPhones. Unlike other antivirus software offerings, AVG’s program does not include options for parents to block certain websites or content on kids’ devices. AVG’s AntiVirus FREE has many useful features that are usually reserved for paid subscriptions, and its customization options allow you to choose how and when your virus scans happen. If you already have a built-in antivirus program on your computer, you can still download AVG as a backup. Its passive mode allows it to run as backup protection while not interfering with your primary antivirus program. If AVG catches something the primary program misses, it will alert you. AVG AntiVirus FREE comes with a file shredder that lets you permanently wipe files using the same technology as the US Department of Defense. AVG has a variety of options to customize how it conducts scans. You can schedule scans for specific times, adjust the intensity of the scans to minimize impact on your computer speeds, and even exclude specific files from being scanned. When you run AVG, you’ll see a black background with green text. Not everyone likes the dark color scheme. Unlike other free antivirus software, AVG AntiVirus does not have a quick scan option, but it does take less time to scan your drive each time you use it. You can run scans on USB drives when you plug them in, but you’ll have to do it manually, as there’s no auto-scan option. Our download of the free AVG program took just three minutes from start to finish. AVG provides easy instructions for downloading and installing the system, making it simple enough for anyone to do it. When we had some issues with the program on our Mac, we went to the website first to find solutions on the message boards. We found the site counterintuitive and difficult to navigate. We recommend registering on the website so you can contact the help desk directly with any questions you may have. AVG AntiVirus FREE holds its own against pricier antivirus software in independent testing, but Mac users beware—AVG AntiVirus is clearly designed for the PC crowd. AVG recognizes that new malware pops up on the internet daily, so it not only blocks new threats when they attack, it also sends them to the AVG online lab for analysis. AVG then updates all its users with the new info. PC users report minimal impact to computer speeds when running the antivirus scans, so your computer’s regular operations still run smoothly while you’re scanning it for viruses. Independent testing group AV Comparatives awarded AVG three out of three stars in April 2018 tests, giving AVG top marks in both performance and protection, citing its ability to block 99.6% of malware and its low rate of false alarms. AVG is compatible with Macs, but our tests with it on a Mac revealed some serious problems. The initial basic computer scan took 6.5 hours to complete, and there was a significant lag in computer operating speeds during the scan. Following the initial scan, we closed the program but were unable to get it to open again by clicking the icon. Online message boards indicate that other Mac users have similar problems that can be resolved only by uninstalling and reinstalling the program. Should I upgrade from AVG AntiVirus FREE to AVG Internet Security? It depends—AVG Internet Security is better for those who spend a lot of time online, with enhanced firewall protection and protection against fake websites. The upgraded program also covers all devices used by you or your family, and it includes the AVG AntiVirus Professional for your Android device. What is AVG PC TuneUp? When you complete a full computer scan using AVG AntiVirus FREE, you might get alerts about junk files, cookies, etc., but you can only fix these problems using a different AVG program called AVG PC TuneUp. AVG PC Tuneup identifies unnecessary files that are using up memory and outdated programs that are causing your PC to run slowly. It automatically updates your software, clears up memory space, and plugs holes in your security. It costs $49.99 per year. Are AVG AntiVirus FREE and Avast Free Antivirus the same thing? Even though the two companies merged in 2016, the antivirus software is still marketed as two separate products. Software experts say that the merging of the two companies created two stronger products with very similar technology, as each product benefited from the strengths of the other. The main differences between the two are mostly cosmetic. If AVG is tracking everything I do, does it collect data on me? Yes, it does gather data from your usage history, but after installing the program, you can opt out of data collection under the privacy settings. How can I get the most out of my antivirus software? Software security experts recommend cleaning up and defragmenting your hard disk and uninstalling any unnecessary software before installing an antivirus program. Leaving at least 20% of your disk free allows your antivirus program to run without slowing down your computer. Be patient and allow the antivirus software to do its job, even if it does create lag in normal computer operations. AVG AntiVirus FREE performs well in independent testing, and PC users are very happy with it. If you’re looking for a simple way to beef up the security on your PC, the AVG AntiVirus Free is a great choice. If you want to protect all of your devices from malicious software, no matter who is using them, then AVG Internet Security can give you added peace of mind. If you’re a Mac user, you should probably look elsewhere for antivirus protection. We created our AVG AntiVirus review by studying its software, reading others’ reviews of the program, and downloading and trying out the program for ourselves. Please read our Methodology to learn more about how we review products.